MINNEAPOLIS — Kyle Flicker was just doing his day job at a machine shop in Blaine, until it turned into a nightmare. "It was a pretty dark time for me...at some point I wished the fire would have just killed me." Flicker was caught in an explosion, he jumped off a ladder and hit his head on a wall, knocking him unconscious. "I was lucky enough to have someone else out there that pulled me out of the fire." Flicker was burned over more than 75% of his body - and spent months at Hennepin Healthcare's Burn Unit. At that point, that's when Flicker said he fell into a deep depression. "I had all of these worries of 'Will I be able to use my hands again? Will I be disfigured?' I had the blinds pulled down and didn't want to talk to people." That is, until Minneapolis firefighter and burn survivor, Jake Laffereire, stopped by. Laffereire brought Flicker gifts, even an Easter basket and he shared his own story of hope and is the very foundation of his non profit - Firefighters for Healing. They want to bring families more hope and help patients have less stress and anxiety during recovery. Once Flicker recovered, he wanted to pass that hope along. "I had a lawsuit involved with the accident and I felt like I needed to give back," and what better organization than the one that got him through his trauma. 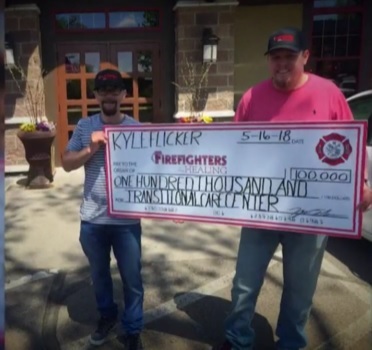 Flicker donated $100,000 to Firefighters for Healing, and Laffereire was moved by the full circle of compassion. "Kyle presented this gift with such love that to me it was so powerful and brought tears to my eyes." The money will go towards the Transitional Care Center for burn survivors, their families and firefighters who need to stay in the Twin Cities for medical treatment. You can help provide supplies for the temporary housing via our Amazon Wish List here or donate to the Capital Campaign here. Older PostHUGE NEWS! Three Apartments for Burn Survivors & Firefighters.